Food preservation has become very popular now. And when you say preserving foods, it involves disinfecting the jars. Among the popular containers in preserving foods are Kerr canning jars. In the United States, they are marketed under brand names ball and Kerr and Bernardin in Canada although they are go under the standard name Glass Mason jars. 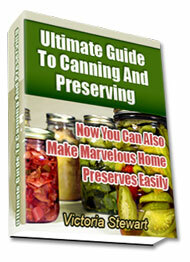 Sanitized canning jars are the initial steps toward making delectable pickles and jams. Why do you need to sterilize Kerr canning jars? Other than creating mouth-watering jams or pickles, this process of safe food handling aids in preventing food poisoning since they containers are germ-free. A regular Kerr jar contains an even metal lid which has a rubber strip around its bottom edge as well as a metal screw-on band holding the cover on the container while being processed in hot water. As soon as your Kerr canning jars have been boiled, the vacuum fastener holds the cover on. A cover which is not securely fastened to the container is a sign that food inside the jar is beginning to spoil. These jars come in regular sizes. Economical cooks can also gather used jars and replacement covers and bands can be purchases individually. These bands may be reused although the lid or cover must only be utilized once and disposed of. The traditional method of making use of paraffin wax fastener is not considered safe. Kerr canning jars can undergo hot water bath which is commonly used for high-acid vegetables and fruits. Modern instructions must be used. On the other hand, low-acid vegetable, fruits, meats and fish could not be securely preserved using a plain hot water pot since they need the pressure canner. In sterilizing Kerr jars, you will need a pot or canner with wire insert intended for sterilizing or sanitizing glass containers. You can find it in various hardware stores. You will also need tongs, jar lifter, lids, jars, bands, basket strainer and dishtowel or newspaper. To clean Kerr canning jars, put empty jars upright on wire frames or rack in the pot. Do not stack them so they will not break. Cover up with water, at least two inches above the tallest container. Make it boil for 30 minutes. To speed up the boiling process, you can add up hot water. Cover the pot while heating. Once the water reaches full boiling point, keep the jars in the pot for ten minutes more. Now, your Kerr canning jars are sterile and free from germs. Put on adequate bands and lids in the basket strainer or another container which will allow the jar to assemble in hot water. Place the cover back over the pot, then turn off heat and prepare the food which you will preserve.